I often receive requests to share my skin care routine and a Spring update was definitely due. After a period of trying too many several new products, I recently decided to take a step back and settle for a more “basic” routine. As much as I am fascinated by advanced formulations, I also recognize that sensitive skin like mine may at times just need to keep it more simple. In fact sensitive skin is more prone to breakout and irritation than other skin types (hence it being called sensitive), so with less ingredients involved you can reduce the chances of a reaction (a general rule is to use products with less than 10 ingredients). On top of that, irritating tap water, stress, and the warm & humid climate have made my skin more reactive than usual. Therefore I am slowly reducing the number of products that I use and I am adjusting my routine to fit my skin needs at the moment. I love me some refreshing cream cleanser in the morning and I am currently using the Aurelia Miracle Cleanser. It has a soft, creamy texture that allows for a quick massage (you may recall an individual review of this cleanser). I remove the cleanser with my favorite face cloths by Morihata, (which have finally become my only face cloths since I began purchasing a few with every Spirit Beauty Lounge order that I place). They are the softest that I have tried and the most gentle to my easily aggravated skin. After cleansing, I spritz my face with a toner/face mist. You guys know how much I love this step and could not be without a good mist because tap water is very irritating to my skin. Therefore, after cleansing my skin is always in need of a soothing, hydrating mist. 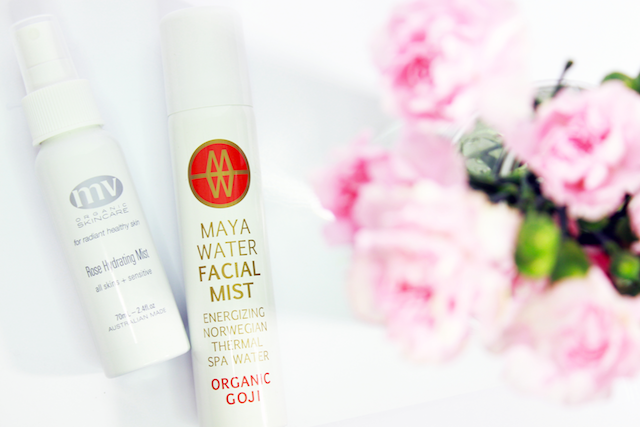 I already wrote about the MV Skincare Hydrating Rose Mist*, while the Maya Water Facial Mists are a newer addition that I am excited about. Maya Water mists only have between two or three listed ingredients based on which one you choose (Pure has 2 ingredients, Goji has 3 ingredients), but they do the job perfectly. I just lightly spritz my face with some face mist and then after a few seconds I apply a moisturizer. For moisturizer I pick over another based on which type of makeup I am going to wear, (if I decide to wear makeup). Under mineral/powder foundation I like to use the Kahina Facial Lotion*. It makes a smooth, light base that works perfectly with powders on top. If I go for a cream product, like a BB Cream or a cream foundation, and I need a more matte base, I use the MV Skincare Rose Soothing and Protecting Moisturizer. Around my eyes, I am still faithfully using the Pai Eye Cream, which I have been raving about for ages and keep repurchasing. I usually get my sun protection from makeup, but when I do not wear makeup I use a face sunscreen product. I am currently getting acquainted with the Pratima Face Sunscreen SPF30, which I only started to use recently and will review as soon as I make up my mind about it. So far, we are in good terms. 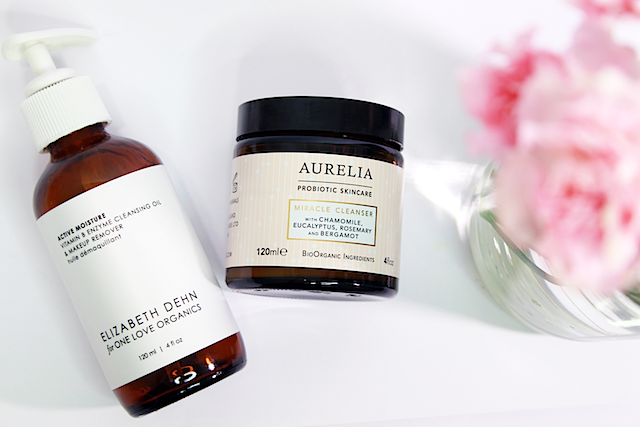 When I am wearing makeup I always use the Elizabeth Dehn for One Love Organics Cleansing Oil to remove it. I have tried another cleansing oil for a little while, but went back to this one because it’s super easy to take off and smells divine compared to the other one (review to come). Most days I also go for a second cleanse with a cream cleanser, to make sure that no dirt or makeup traces are left on my skin. I then spritz my face with one of the two face mists I mentioned before, and then apply a face oil. I am still using Kahina’s Argan Oil (I think that I already went through three bottles of this, and I am ordering a fourth one). 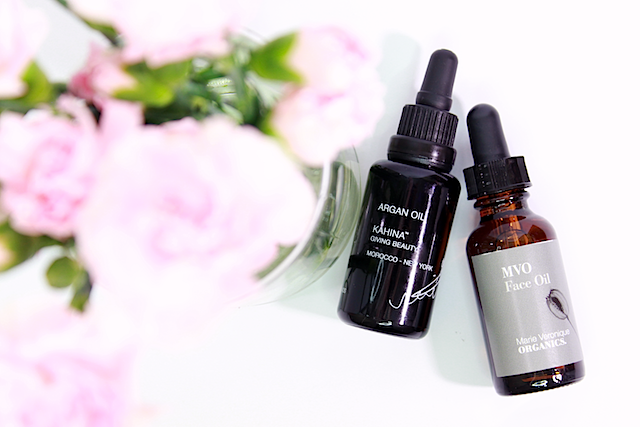 However, in light of how well the MVO Face Oil worked for me in the past I recently purchased a new bottle and I am now hoping to see the same incredible results I experienced in the past. I also apply my face oil around my eyes because neither of the two oils I am using have caused any puffiness or reaction. The only one mask that I am using at the moment is the Yuli Pure, once/twice a week. I keep it on for about ten minutes and then rinse it off. This mask is magic to heal breakouts, and improves the appearance of my skin immediately. It seems like it peels off a layer of dull skin off my face, but it is not an actual exfoliating mask. If you’re skeptical about it, order a sample. I am sure you will go back for a full-size. Except for a new cleanser that I have only used for a couple days, these are all the products that I am using daily. I have to admit that since I started to use this new cleanser my skin looks like it’s clearing out miraculously, but I will give it more time before writing a post about it. In the meanwhile, it looks like the less products I use, the best my skin feels and looks. While doing too little for my skin may turn it into an oily, congested mess (I tried that, and it was a disaster), I think that overdoing may cause it to react. What do you think about that? 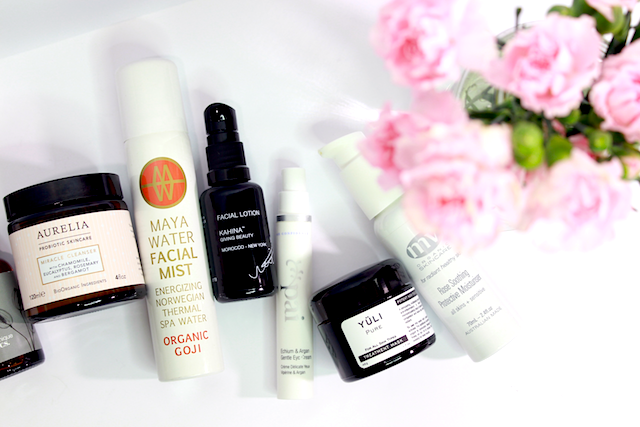 When it comes to skincare, are you a minimalist or do you like to incorporate a lot of products? I would love to know your thoughts, especially if you have sensitive skin. 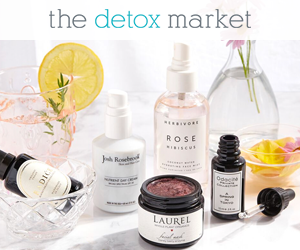 **Please note that some of the products that I mentioned were previously reviewed, and by clicking on them you would be re-directed to the review. However if you have any additional questions about any products or would like me to write a ore in depth review, please leave a comment below and I will do my best to reply in a timely manner.